Many of our members have provided photos, advertisements, newspaper and magazine articles and other pertinent information that traces the history of Candlewood Trails. If you want to provide photos, stories, documents, etc., for this website, contact Henry Beary at Henry@HGBdiversified.com. 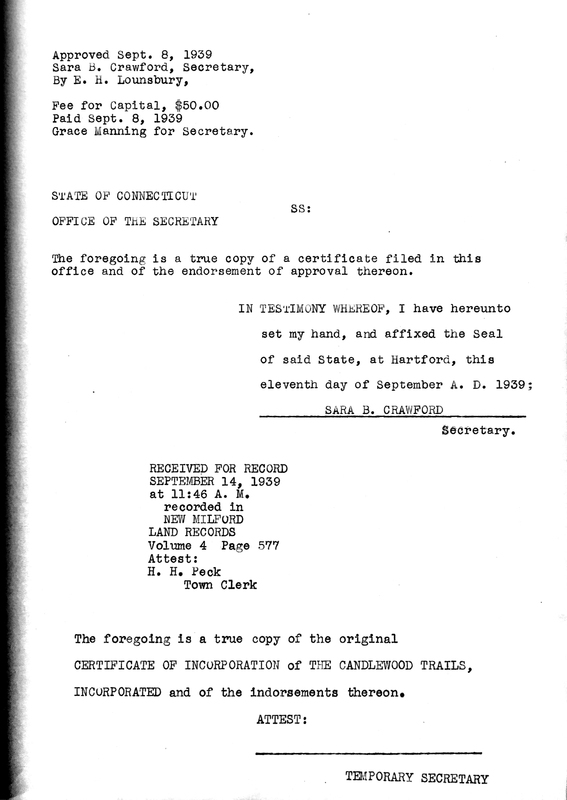 This document shows the Certificate of Incorporation for the Candlewood Trails Association, Inc., dated September 11, 1939. In 1935 the New Milford Times included an insert entitled "Guide to Lake Candlewood and Environs". Click here to see an advertisement for Candlewood Trails and a community description from the Guide; keep in mind that it was written in 1935! Can you identify the home in the ad? This link contains some historic brochures for Candlewood Lake real estate. A view of the CTA beach, 1937. A view from the bottom of Beach Drive, 1935.